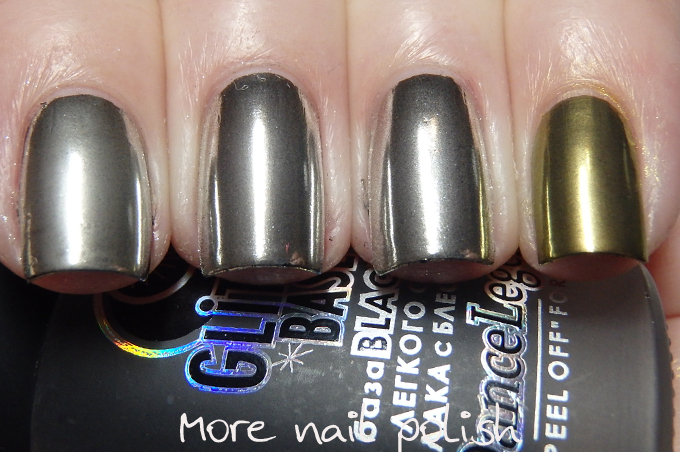 The Polish Chrome Wars Part 5 - Chrome Powder Comparison - Are all brands the same? Mirror Mirror on the wall, who is the chromest of them all? 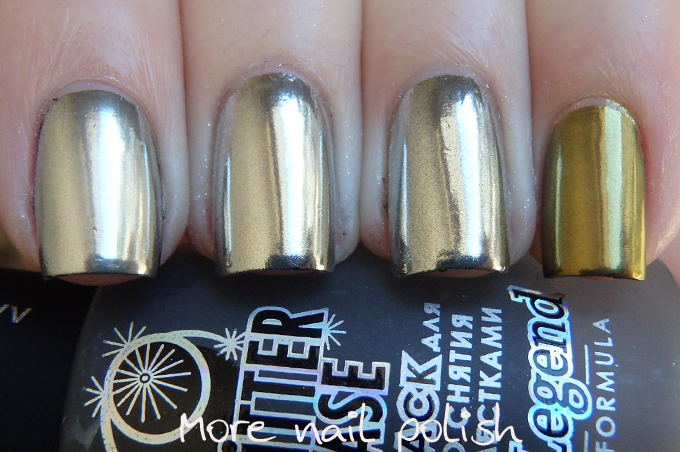 Part 5 of the Polish Chrome Wars answers the question: Are all chrome powders created equal? To start with, my sample size is small, minutely small, just three different brands. I couldn't justify purchasing any other brands to pit them against each other and I figured comparing these three would be close enough to answering the question. There are so many other brands out there of course, and if any of them think their chrome powder is the best and want to send me their chrome powders to compare, then I'm more than happy to do that. My next caveat is that I have not applied my chrome over gel polish. This is because I don't have a no wipe top coat and I find I get much better results using Dance Legend peel off glitter base polishes than regular gel polish. All these swatches only show one coat of black Dance Legend Glitter Base and one rubbing of the chrome powders into my nail. None of these have top coat for the purpose of the comparison. But if I were to top coat them, I'd use a water base top coat as we learned in Part 4. OK, my comparison is between the chrome powders from Daily Charme (#3 grade) the Born Pretty Store and Bright Silver 10-100 powder from Spectraflair4U. Pinky = Born Pretty gold mirror powder cause why the hell not. And now in full sun. My verdict. No they are not all created equal. The chrome powder from Daily Charme is chromest of them all. 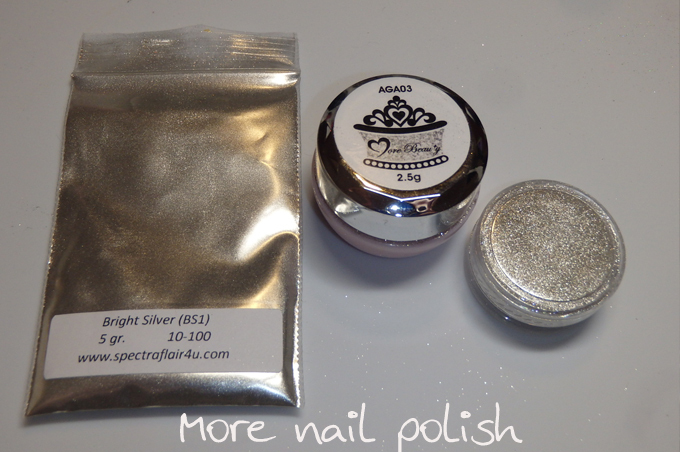 A close second is the powder from the Born Pretty Store, then the Bright Silver from Spectraflair4U. But we do have to remember that we are looking at macro photos here that are much, much larger than you look at your nails in real life, and given this, you definitely can go with the cheaper options and still get nearly the same effect. The price difference on these products is quite significant and it appears that you do pay for what you get. The most expensive is Daily Charme at $16.90 for a 1 gram jar. The Born Pretty one is pretty cheap at $1.99 for the 1 gram jar and the Bright Silver from Spectraflair4U is $6.50 for a 5 gram jar (which has a price per gram of $1.30) making it the cheapest. As you can tell I did eventually get my parcel from the Born Pretty Store. The shipping from China was pretty quick, but it was the fact that my parcel took 18 days to be dispatched that annoyed me. They have advised that the reason it took so long was because the powders were out of stock. I have now informed then that customer service would normally contact someone advising of the delay due to out of stock products, rather than us just sitting here waiting. Or better still, don't sell a product unless you have it in stock. They were courteous in taking on my suggestions. What do you guys think? Do you think the extra price is worth the extra shine? 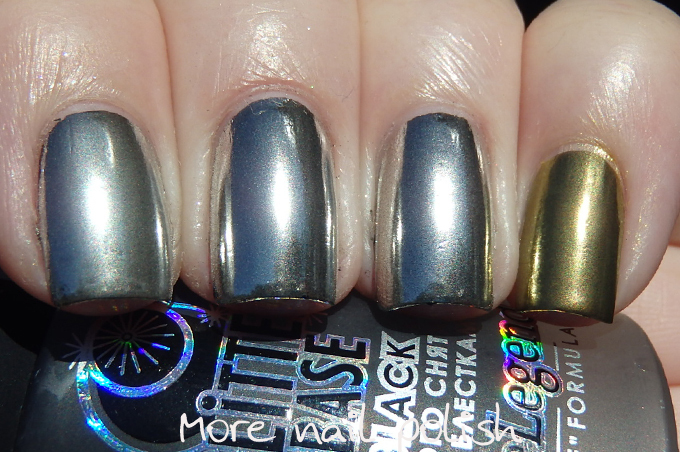 I got the BPS multichromes, and will be showing those soon, but I'd love to have something else to compare them too, so am trying to find another brand of multichrome powders that won't break the bank. I love how the chromes look... but it just seems a bit too much work for me. Too much chemistry. I got a bit crazy about stamping awhile back and now I'm afraid to try something like this because I know I'll get obsessive. Hahah I'll leave that to the bloggers! I've found that sometimes Born Pretty is really bad about updating their tracking info. I've never paid for the tracked package though and I know you mentioned you did - but once I only got my shipping notification about 2 weeks AFTER I'd received the package, so. I do wish they'd be a bit more organised, but nothing has yet been enough to put me off from using them and their good prices. How ironic! I just left a reply on Part 4 to fill you in on BPS's inventory control issues. I told them the very same things you did. One item was out of stock on my $30+ order...large by BPS standards IMHO with everything being so darn cheap. I looked up the item once I knew what the hold up was and, to my surprise, it was still listed for sale. And it continued to be listed for sale while we argued about my refund for 2 weeks. Clueless. I can't really afford it but I am going to pay more, if need be, to purchase from anyone but them.